I learned how to make an Easter bunny cake at first using two round cake pans. This cake represents the creature that brings the Easter eggs; why a rabbit brings chicken eggs, I will never understand. Supposedly, the rabbit is the most fertile of the animals and symbolizing the new life in the spring. Wouldn’t you know that this came from folklore of my German heritage! Sometimes I wonder about my German ancestors! I am surprised that it didn’t go on to add that the Easter bunnies also colored the chicken’s eggs. These stories or tales started back in the 1500s in Germany; as the German immigrants came here to the United States they brought their folklore along. I always begin Easter morning with a French toast recipe I have not found the origins of this tradition. After hundreds of years of telling these tales to the children, someone came up with the idea of making these shapes which are edible. This is why I learned how to make an Easter bunny Cake and marshmallow Easter candy recipe. This tradition has carried on until this day even here in the United States although it has nothing to do with the actual reason for celebration of Easter. The crucifixion and resurrection of Jesus Christ which make the cross cake popular. 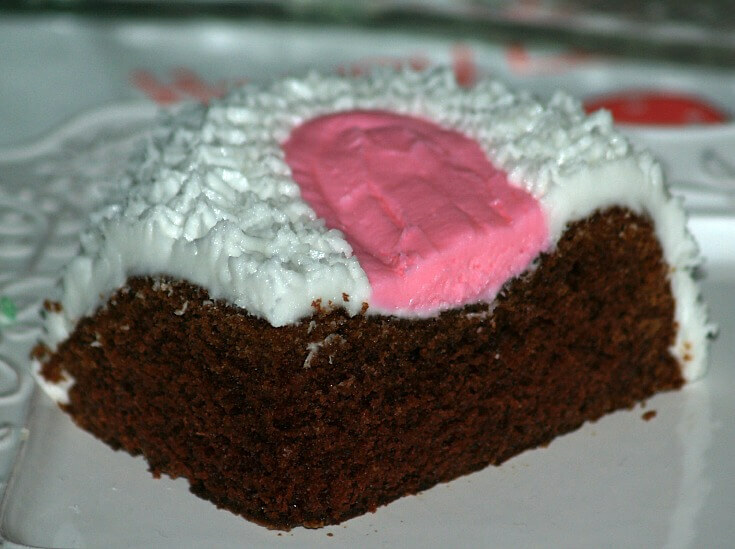 I must say I do enjoy making and eating these great creations like this chocolate buttermilk cake recipe, raspberry jam cake and Coca Cola cake recipe. 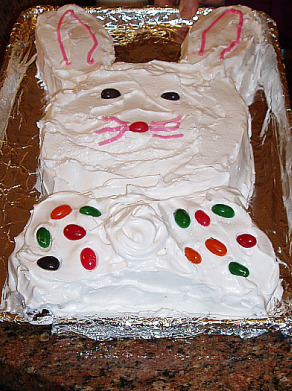 When I learned how to make an Easter bunny cake, I found it to be a lot of fun and the children really love it. There are several different ways to design a cake like this. A bunny cake can be bakes in layer pans, sheet pan, loaf pan or pans that already shaped like a rabbit. You can use almost any kind of a cake recipe, even a box cake mix. Watch the two videos large bunny (below) and small bunny to see how I turn a layer cake and a loaf cake into different types of bunnies. 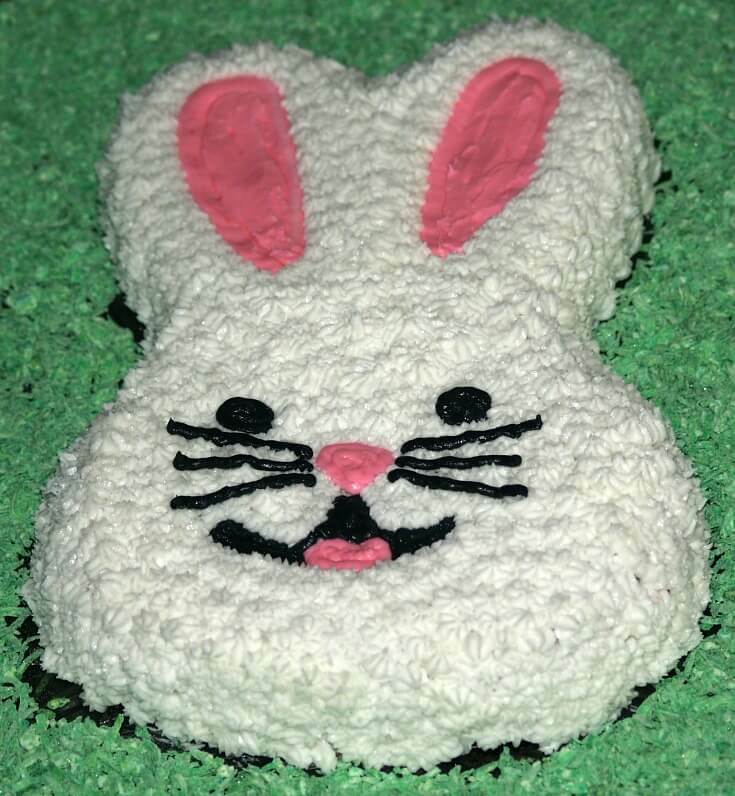 The first recipe below is one that I used for a large Easter bunny cake made from 2 round layer pans. You can use the filling or not; I like to slice the cold layers and spread the raspberry filling in the middle. Grease and flour 2 eight inch round baking pans. Sift together in a mixing bowl the flour, sugar, cocoa, soda, baking powder and salt. Add the eggs and oil. Mix while adding the buttermilk, coffee and vanilla; Beat until well blended. Divide equally between the two prepared baking pans. Bake for 30 minutes or until pick comes out clean when tested. When the cakes got cold, I sliced each layer horizontally. This is not necessary to do but I like the flavor of chocolate and raspberry together. Place berries in a saucepan and add the sugar. Mix a little of the water with the cornstarch until smooth. Add remaining water to the berries and heat on medium until sugar dissolves. Add the cornstarch mixture to the berries and stir over heat until thick. Spread between the cake layers. Combine the sugar, corn syrup and water in a saucepan. Heat to dissolve sugar; bring just to a boil. In a large mixing bowl, beat the egg whites and cream of tartar. When frothy add the vanilla. Continuing beating on high speed slowly adding the hot sugar syrup. Continue beating until stiff peaks form. Spread on cake while warm. Preheat oven to 350 F Degrees; grease and flour 2 round 8 inch, 9x13 or shaped pan. Combine sugar, salt and flour in a large mixing bowl; set aside. In a saucepan, bring to a boil butter, oil, water and cocoa powder. Add saucepan mixture to flour mixture. Beat eggs, baking soda, buttermilk and vanilla; add to the chocolate mixture. Pour batter into prepared pan (or pans). Bake 20 to 45 minutes (depending on pan size); test with pick. Frost as desired with favorite frosting. Combine and mix together flour and sugar in a large mixing bowl. Combine in a saucepan butter, oil, cocoa and Coca Cola; bring to a boil while stirring. Add marshmallows and stir until smooth; pour mixture over flour and sugar and blend well. Add buttermilk, eggs, baking soda and vanilla; beat 2 minutes. Pour batter into 2 8 or 9 inch round greased and floured cake pans. Bake for 25 to 30 minutes or until pick comes out clean; after 10 minutes remove from pans. Frost cold cakes with any white frosting and decorate following bunny cake recipe on video. This is a fruit and nut bunny cake recipe; follow video to design bunny. Cream butter and sugar; add eggs one at a time beating after each. Add jam to this mixture. Sift flour, salt, soda, cinnamon, allspice and ginger together; stir into flour mixture raisins, nuts and mincemeat. Add flour mixture and buttermilk alternately to the butter sugar mixture. Blend in flavorings to mixture; divide evenly into 2 greased and floured 9 inch round cake pans. Bake about 50 to 60 minutes or until pick comes out clean.